This website is for educational purposes only, supplying only educational books and DVD's. If you are interested in purchasing MMS/CDS products, for worldwide delivery we recommend NZ Water Purifier Ltd.
MMS products are not medicines or drugs. MMS is used to make chlorine dioxide, a proven pathogen killing mineral used extensively in the hygiene and water treatment industries to destroy bacteria, viruses, pathogens and other harmful organisms in water. The human body is 60 - 70% water. Click here to watch the MMS documentary 'Quantum Leap'. Click here to buy the online video course. New Book from Archbishop Mark Grenon, " A World Without DIS-EASE, IS IT Possible?" History of “western medicine” that will open your eyes and hopefully motivate MANY start to do something about it! Genesis II Church 10 sacramental commandments fro “restoring health”. ALL the information about the G2Church you will need in ONE book! Information presented on this website is for educational purposes only, and is NOT intended to diagnose, treat, cure, prevent disease or replace the advice of a licensed HealthCare practitioner. It may seem like a miracle, but it's just plain chemistry! The MMS protocol consists of activating Sodium Chlorite, to form Chlorine Dioxide. Chlorine Dioxide has been scientifically proven, and is officially accepted to be a highly effective destroyer of pathogens, fungi, disease, bacteria and viruses. It is 'officially approved' for this purpose; being commonly used in several brands of disease treating mouthwash, in drinking water, on food preparation areas, and even on living or harvested produce. It is little wonder that it should be discovered to have the same benefits in the human body! Third, it is accepted as being self-evident". - Chlorine Dioxide is a scientifically proven pathogen killer used extensively in drinking water. - Chlorine Dioxide is an approved disease treating ingredient in several brands of mouthwash. - Chlorine Dioxide 'supports' healthy Immune System function. (Food Contact Substance CAS Reg. No. 10049-04-4). "...the relative safety of oral ingestion of chlorine dioxide... was demonstrated". (In one 6-month phase of the tests, the dosages were the same as MMS doses). - Chlorine Dioxide has undergone official trials by the Red Cross in Uganda, and overcame malaria in less than 24 hours. A documentary of this trial can be viewed on youtube by searching 'malaria MMS Red Cross Uganda (18 minutes)'. So if Chlorine Dioxide has passed clinical trials for safe human consumption, and is already scientifically proven and 'officially' accepted to effectively overcome disease; then why do some news articles and websites warn about the dangers of using MMS? Is there any validity to the various claims being made about MMS being dangerous? If the attacks by mainstream media regarding using MMS are truly about safety, then why do we never hear them reporting about the hundreds of thousands of people who die each year from vaccines and pharmaceutical drugs? MMS has not be proven to have killed anyone! If their concerns are truly that a product should not be used if it can potentially cause vomiting or diarrhea, then shouldn't they also focus on banning chemotherapy, which DOES cause these plus many far more serious side effects, (the chemotherapy warning insert actually lists 'cancer and death' among the many horrible side effects). If their concerns are about a product being used in the body that is toxic (although in the case of Chlorine Dioxide, it has been proven safe for human consumption); then why do we not hear mainstream media warnings about vaccines being injected into people that contain toxic ingredients such as formaldehyde, thimerosal, mercury, aluminium, and many others. If bleach is dangerous, then why did authorities in quake stricken Christchurch advise people to put bleach in their drinking water? And do 'official' double-blind tests of 'approved' products, really safeguard the public? Apparently New Zealand law restricts the advertising of certain products known to demonstrate therapeutic benefits. 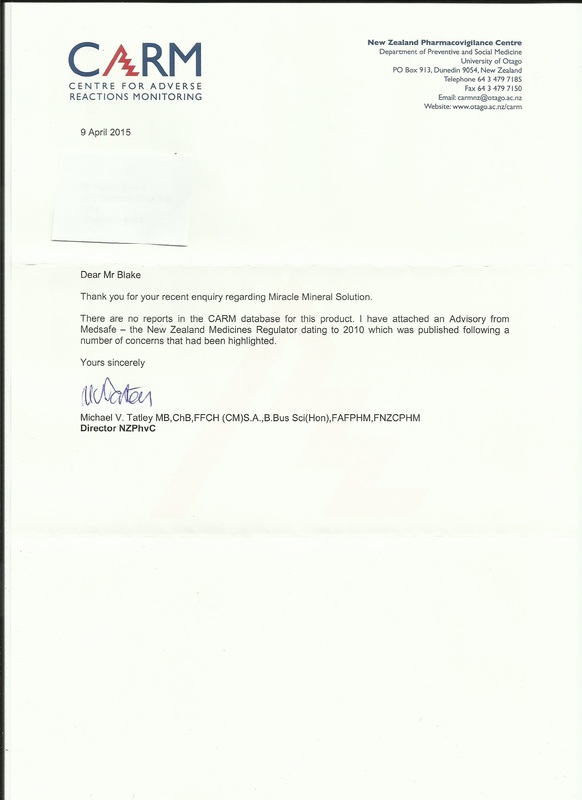 See letter from Medsafe NZ. Therefore, regardless of the many thousands of success stories worldwide, and recommendations that you may have heard from family and friends; this website cannot and will not make any public claims that MMS 'treats' or 'cures' serious diseases or conditions; such as asthma, diabetes, autism, heart disease, arthritis, HIV, AIDS, cancer, leukaemia, malaria, hepatitis A, B and C, herpes, TB, lyme disease, multiple sclerosis, psoriasis, sarcoidosis, scabies, candida, bronchitis, CHD, COPD, MRSA, crohn's disease, colds, sore throats, dementia, dengue fever, eczema, swine flu, allergies, acne, gum problems and many others. It is unclear as to what standards are used in this approval process. For example, of the many that could be quoted, the pain killer drug Vioxx and the diabetes drug Avandia, are examples of products that were approved by Medsafe. Shouldn't any proper testing and evaluation have picked up on these potential dangers? A Royal Commision of Inquiry is normally carried out when an incident causes the death of a dozen of so people. So why don't we see such actions taken when a drug kills tens of thousands of people? Two Medsafe officials we spoke with, have acknowledged this as fact. So what does this mean? Even though there are already several known natural cures for cancer, if one of them were to be 'officially proven' as such, through official clinical trials, it could never be publicly advertised as a cure. The wording of the Medicines Act 1981 prevents this from ever happening; along with the public advertising of cures for all the other diseases listed in Schedule 1 of the Act. As a well documented example, Dr Burzynski in the USA developed a safe and effective cancer cure that has been fought for decades now by the 'powers that be'. It appears that this discovery is being purposely resisted, and suppressed from public reach (in much the same way as with MMS), as it would destroy the multi-billion dollar cancer industry, and dry up government and private sector funding to pharmaceutical run cancer research institutes. This unbelieveable story, of how the FDA have spent millions trying to keep this safe and effective cancer cure discovery from public reach, can be viewed on a youtube documentary. Search 'Dr Burzynski full version' on youtube; you have to see it to believe it! This is not the first time that this type of suppression has occurred. Natural cancer cures have been suppressed for many decades now. Search 'Cancer: The Forbidden Cures' on YouTube to see the history of the ongoing criminal actions of 'the powers that be'. Another documentary that we highly recommend is called 'A World Without Cancer'. This documentary not only has beneficial information for cancer sufferers, but also reveals how you can easily avoid getting cancer in the first place. Search 'A World Without Cancer' on youtube. This is suppressed information that the whole world needs to know about. MMS is principally a water treatment product. MMS (28% sodium chlorite), when mixed with a suitable activator produces chlorine dioxide. Chlorine dioxide is scientifically proven to be one of the most powerful pathogen killers known to man, and is commonly used in ‘water systems’. It safely destroys viruses, bacteria, fungi, and disease causing pathogens in drinking water, food preparation areas, and even on living and harvested produce. MMS can be safely consumed when used to purify drinking water. When you consider that the human body is 60 to 70 percent water, you could also class the human body as being a ‘water system’. For travellers, MMS is perfect for treating drinking water when it is suspected of having a high risk of disease. Many water treatment plants worldwide are switching to chlorine dioxide due to its superior pathogen killing abilities. Chlorine dioxide is very different to chlorine, and destroys pathogens by oxidation, not chlorination. It does not harm healthy cells and beneficial bacteria in the body. The oxidation potential of various oxidisers is measured in volts. Oxygen has a oxidation potential of 1.3 volts. Hydrogen peroxide is 1.8 volts. Chlorine dioxide is only 0.95 volts. This means that any healthy cells and beneficial bacteria that are not harmed by oxygen, will definitely not be harmed by chlorine dioxide, because chlorine dioxide has a lower oxidation potential than oxygen. Does chlorine dioxide produce byproducts? Chlorine dioxide produces significantly less disinfection byproducts than chlorine, being another reason why many modern water treatment plants are switching to chlorine dioxide. Chlorine dioxide only reacts with substances that give off an electron. Chlorine, oppositely, adds a chlorine atom to or substitutes a chlorine atom from the substance it reacts with. During an oxidation reaction, chlorine dioxide is reduced to chloride, and no chlorinated substances are formed. Alternatively, when chlorine reacts it does not only accept electrons; it also takes part in addition and substitution reactions. During these reactions, one or more chlorine atoms are added to the foreign substance. Chlorine dioxide is used primarily (>95%) for bleaching of wood pulp, but is also used for the bleaching of flour and for the disinfection of municipal drinking water. The New York water treatment plant first used chlorine dioxide for drinking water treatment in 1944. Chlorine dioxide was introduced as a drinking water disinfectant on a large scale in 1956, when Brussels, Belgium, changed from chlorine to chlorine dioxide. Chlorine dioxide is used in many industrial water treatment applications as a biocide including process water and food processing. Chlorine dioxide is less corrosive than chlorine and superior for the control of Legionella bacteria. Chlorine dioxide is far superior to copper-silver ionization for Legionella control because unlike copper-silver ionization, chlorine dioxide is: 1) an EPA approved biocide, 2) not negatively impacted by pH and 3) does not lose efficacy over time because the bacteria grow resistant to the biocide. It is more effective as a disinfectant than chlorine in most circumstances against water borne pathogenic microbes such as viruses, bacteria and protozoa – including the cysts of Giardia and the oocysts of Cryptosporidium. It can also be used for air disinfection, and was the principal agent used in the decontamination of buildings in the United States after the 2001 anthrax attacks. After the disaster of Hurricane Katrina in New Orleans, Louisiana and the surrounding Gulf Coast, chlorine dioxide has been used to eradicate dangerous mold from houses inundated by water from massive flooding. Stabilized chlorine dioxide can also be used in an oral rinse to treat oral disease and malodor. [It is important to note that the chlorine dioxide used in industry, is of different concentrations and forms to that produced by the MMS available from this website]. So are the benefits of chlorine dioxide for the human body limited to drinking water purification and to 'treat oral disease', as seen in Wikipedia? No; it has actually been used successfully by thousands of people for dozens of the diseases we commonly face today. Caution flags often rise immediately when the term “miracle” is used to describe anything that amazes us, or when we don’t understand how it does what it does. In this case, it is indeed amazing. However, an explanation of why MMS is so effective as a pathogen destroyer is possible. It’s not the MMS that destroys pathogens; the chlorine dioxide does that. When you understand the chemistry, you’ll see that it’s not a miracle… it just seems like one. This oxidiser attacks germs, bacteria and viruses that are harmful to the body. When used in the body, MMS supports healthy Immune System function. Chlorine dioxide is a chemical compound that consists of one chlorine ion bound to two ions of oxygen. Using the MMS protocol, you will produce chlorine dioxide in the range of 1ppm. The MMS solution is 28% sodium chlorite in distilled water. You can produce chlorine dioxide with a single drop, when an "activator" of 4% hydrochloric acid, 50% citric acid, vinegar or lemon juice is added. "Applications" of chlorine dioxide range from 1 drop to a maximum of 12 drops. A "maintenance application" is six drops. After adding the activator, the chemical reaction that turns sodium chlorite into chlorine dioxide takes only 20 seconds if using the 4% hydrochloric acid or 50% citric acid; or 3 minutes if using lemon juice or vinegar. The activating ingredient in vinegar that makes the change possible is acetic acid. This weak acid acts like a blasting cap by lowering the pH of the chlorine dioxide, without setting it off. The natural pH of sodium chlorite is 13. Adding hydrochloric acid or citric acid or lemon juice or vinegar creates about 3 mg of unstable but still harmless chlorine dioxide. When a chlorine dioxide ion contacts a harmful pathogen in a 'water system', it instantly rips up to five electrons from the pathogen, in what can be likened to a microscopic explosion… harmless to us, but terminal for pathogens. The pathogen – an electron donor – is rendered harmless due to the involuntary surrendering of its electrons to the chlorine dioxide – an electron acceptor – and the resulting release of energy. Oxidised by the chlorine ion, the former pathogen becomes a harmless salt. Once it encounters various pathogens in 'water systems', chlorine dioxide performs a highly energetic acceptance of four electrons when it comes across any cell that is below a pH value of 7. This means that diseased cells are essentially vaporised (i.e., “oxidised”) while healthy cells are unaffected. 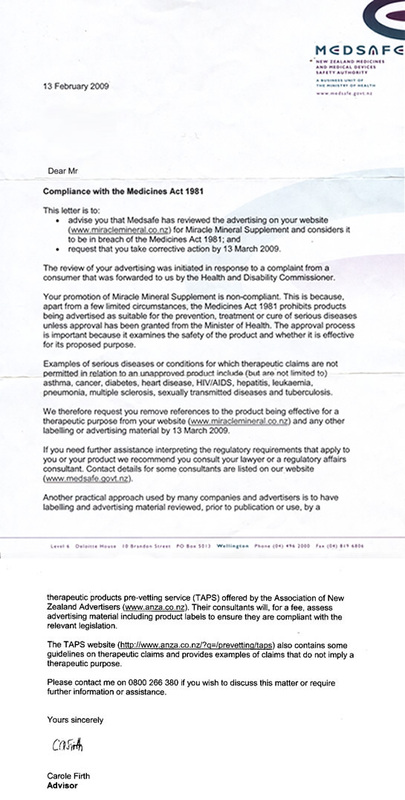 Here is the letter we received, outlining the reason why we are not permitted to advertise MMS as having therapeutic benefits for the prevention, treatment or cure of serious diseases. Note: the complainants negative judgement was not a result of using MMS. 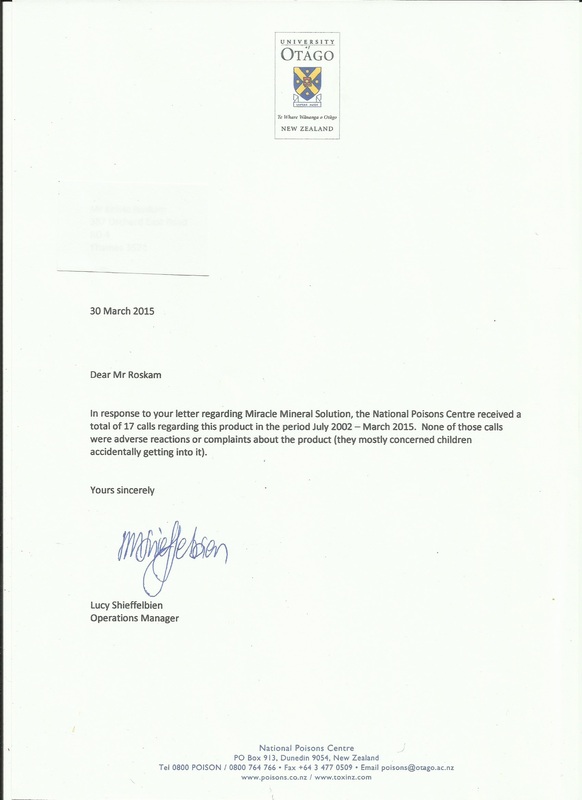 The National Poisons Centre has received no complaints. CARM has received no complaints. 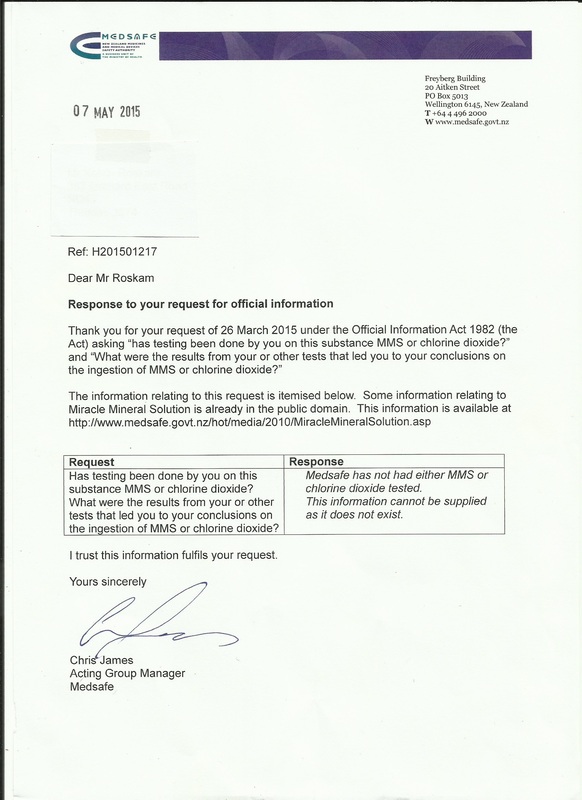 Medsafe admit that their department has conducted NO testing of MMS or chlorine dioxide. 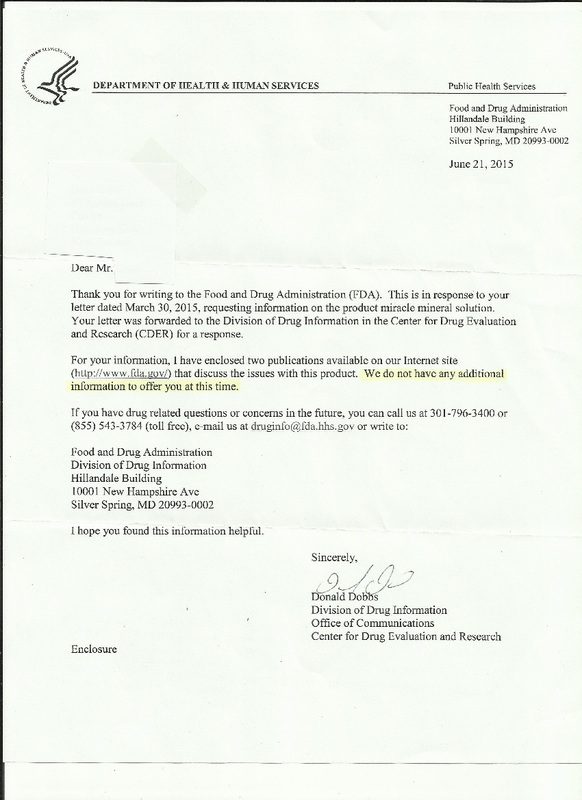 The FDA admit that their claims about MMS being dangerous are not supported by scientific evidence. Many countries have laws restricting the promotion of certain products known to demonstrate therapeutic benefits. Statements expressed within this site have not been evaluated in relation to any such laws. Note also, this website may contain links to other websites operated by other parties. These links are provided for your convenience and reference only. Miracle Mineral is not responsible for the content or products of any linked site or the links contained therein. Miracle Mineral does not dispense medical advice, prescribe, or diagnose illness. Any views and ideas expressed by Miracle Mineral are not intended to be a substitute for conventional medical advice or service. You agree that no responsibility or liability will be incurred to any person or entity with respect to any loss, damage, or injury caused or alleged to be caused directly or indirectly by the information contained within this site. If you have a severe medical condition, please see a licensed healthcare practitioner.